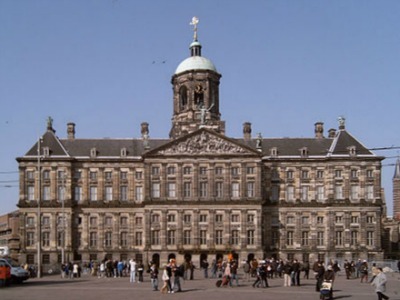 The 'Paleis op de Dam', the Royal Palace of Amsterdam, is the official reception Palace of the Royal House of the Netherlands. It is one of the three palaces owned by the state that is available to the Dutch Royal family. The palace was build as the Amsterdam Town Hall and was later turned into a royal palace by Louis Napoleon (King Lodewijk I). 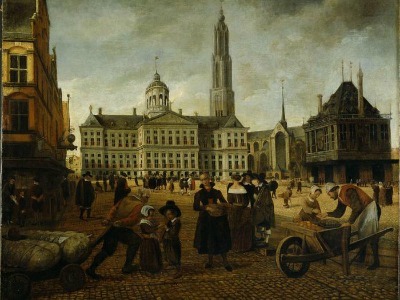 In the seventeenth century (the Dutch golden age), Amsterdam was the principal trading center of the world due to the success of the Dutch East India Company, at the time, the largest trading company in the word. The eighty years' war came to an end in 1648, the same year that the first pole was struck for the new Town Hall in Amsterdam. More than 13.000 poles were needed to prepare the ground for the building. The four mayors of Amsterdam appointed Jacob van Campen as the architect. He had made an extraordinarily monumental, expensive and prestigious design. A whole block of buildings was demolished to make way for the first detached building in Amsterdam, where houses and buildings usually were built side to side due to the lack of space. Cost nor effort were spared to glorify the power and reputation of Amsterdam. the Antwerp sculptor Artus Quellinus was appointed to develop decoration for the interior together with famous painters such as Rembrandt van Rijn, Ferdinand Bol and Govaert Flinck. The floor of the citizen’s halls was laid in with Italian marble. The Amsterdam population called their new building the eighth wonder of the world. In addition to the offce of the four mayors of Amsterdam the building served as a administrative and legal center where justice was spoken and political and business deals were made. The Schout and the Schepenen made up the tribunal who adjudicated on all kinds of legal issued and could pronounce death sentence. Through a hole in the wall between the tribunal and the mayor's room the mayors were able to attribute to the court case. 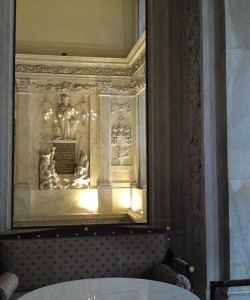 The picture on the left shows the window from the Mayor's room to the tribunal. According to tradition, the population had to be able to attend the trial of death sentences. Therefore there were no windows in the tribunal, only bars on the windows, and for notorious lawsuits the people would gather around these windows to get a glimpse of the accused. As the real lawsuit had already taken place somewhere else earlier the verdict would always be a death sentence. This could be carried out in different ways such as beheading which would take place out on the Dam square. People were also hanged, strangled or drawn. In 1806, Louis Napoleon, brother of the French Emperor Napoleon, was appointed King of Holland. In 1808 he took up residence in the City Hall and transformed it into a Royal Palace. The cells became wine cellars and he covered the cold marble floors with precious carpets. He transformed the city hall to a palace in Empire Style, the style of the French court at the time. 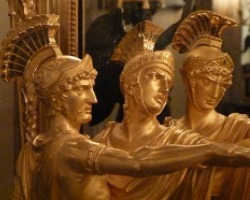 What you can see at the palace today is one of the best preserved and most complete empire collections in the world. Hortense de Beauharnais, Queen Consort of King Lodewijk I of Holland. She was the daughter of Josepinhe de Beauharnais, therefore stepdaughter of Emperor Napoleon. On the picture her first born son Napoleon Charles Bonaparte who died in may 1807. His wife, Hortense de Beauharnais, was the daughter of Joséphine Tascher de la Pagerie, the first wife of Napoleon Bonaparte. She could not stand the smell of the canals in Amsterdam and had a very bad relationship with her husband. She was therefore not happy with her new status as Queen of Holland and would rather stay in France. 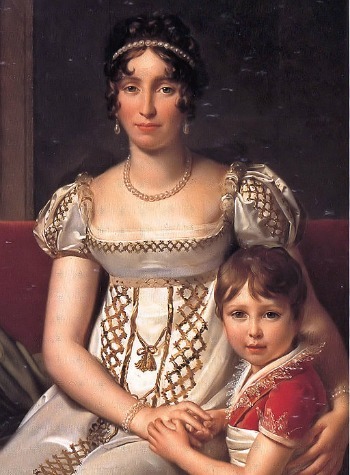 When her first son died in 1807 she was allowed to move back to France because that would be better for the health of her other son Louis-Napoléon. However, when Napoleon Bonaparte married his new wife in 1810 she was forced to go back to the Netherlands since Napoleon did not think it would be appropriate to have the daughter of his first wife at court. She only stayed until June 1810 when she went back to France again. 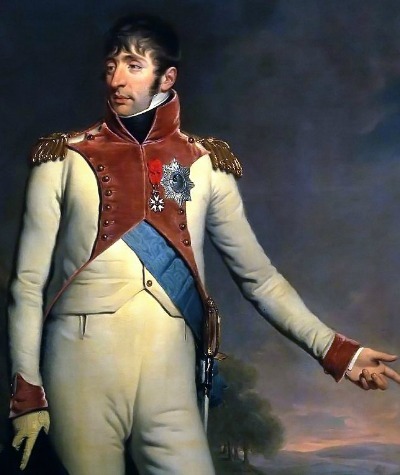 King Lodewijk I left the Netherlands in 1810 since his brother emperor Naploleon forced him to abdicate as he would not follow his orders and was acting too much as an independent ruler. 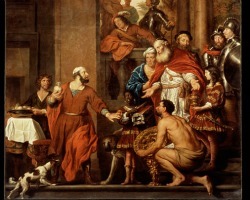 In 1813, at the end of the empire of Napoleon, Willem Frederik van Oranje-Nassau came back to Amterdam from exile and proclaimed that the palace would be returned to the city of Amsterdam. As King William I he understood the neccessity to stay in Amsterdam for some time and he would use the Royal palace frequently. His succesors however did not have that much interest in the palace and only used it on some official occasions. In 1935 the City of Amsterdam sold the palace for 10 million guilders to the state, who made it permanently available to the Dutch Royal family. Nowadays it is used for official occasions. On 30 April 2013 Her Majesty Queen Beatrix signed the Act of Abdication in the Moseszaal of the palace. Then the royal family appeared on the balcony of the Palace. After the investiture of King Willem-Alexander in the Nieuwe Kerk there was a reception in the Citizens' Hall of the Royal Palace. The Royal Palace in Amsterdam is open to visitors as much as possible. We do recommend to check the Calendar on the official website of the Palace. The Palace is the official reception Palace of his Majesty the King and therefore closed when there is a royal event. Parking in Amsterdam is not easy an not cheap. We can recommend Parking Oosterdok, which is in the center of Amsterdam only a few minutes walk to Dam Square.